Gastric Sleeve Weight Loss Timeline, Chart  - What to Expect! Gastric sleeve surgery is an effective tool for obese individuals to lose weight and keep it off long-term. 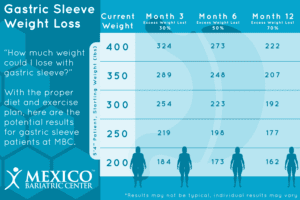 The sleeve helps people drop pounds quickly and develop a healthy lifestyle. Our gastric sleeve prices start at $4,795. Be our next success story! How Much Do I Lose After Gastric Sleeve? 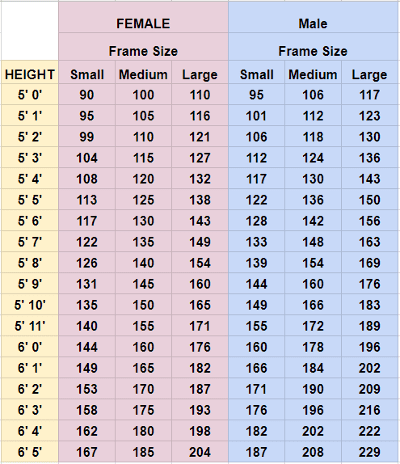 Find out your Ideal Weight from this table here. A female who is 5′ 4” and weighs 250 lbs with medium frame size. Her ideal weight from the table is 120 lbs. She can expect to lose on average 85 lbs within the first year after gastric sleeve. Studies have been performed to depict both short-term and long-term success rates after gastric sleeve surgery. These studies look at how much weight was lost and how long that weight was kept off. Most gastric sleeve patients lose up to 60% of their excess weight in a year and up to 70% of it in two years. Resolution of comorbidities occurs in just one to two years following weight loss surgery. One Swiss study learned that patients kept off at least 57% of their excess weight five years following their surgery. Long-term success shows significant improvements in the risk of stroke or heart disease and a decrease in countless obesity-related medical conditions. The U.S. National Library of Medicine Study looked at different weight loss procedures to see how all of them compare regarding weight loss. The study found that when patients were followed up within 1, 2 and three years after surgery, those who had gastric sleeve surgery had more of a considered long-term weight loss chart than other surgery types. In the gastric sleeve weight loss chart, just 6.3% of the patients had any complications at all. 60% of the patients studied had experienced major weight loss in just one to two years (18 months) following their surgery. Also: Will The Stomach Stretch After Gastric Sleeve Surgery? Another study, the Surgery for Obesity and Related Diseases Study, looked at how successful gastric sleeve surgery was at helping patients keep weight off for an extended period. It looked at the results of patients who had the surgery five years ago. Things such as total weight loss, how quickly weight was lost, quality of life and complications were all evaluated. The average amount of excess weight loss for those studied in this professional study was 61.5% after just one year and 61.1% after just two years. The average for all five years for 57.4 percent (pretty close to the expected weight loss surgeons usually tell patients at their consultation). 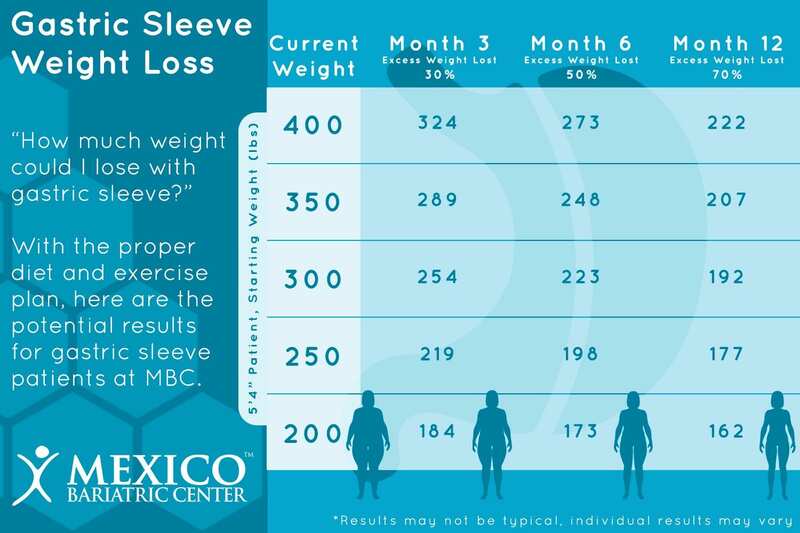 At Mexico Bariatric Center®, we see patients more often to lose 80% to 100% of their excess weight within the first two years after surgery. Our data show a strong correlation between the amount of excess weight loss with following the post-op diet, exercise routine, and healthy lifestyle habits. We also see significant improvements and/or remission in comorbidities such as type II diabetes, high blood pressure, high cholesterol, and obstructive sleep apnea. *Everyone loses weight at there own pace. Results vary and may not be typical.